Three lucky pilots enjoyed a rare easy bay crossing in smooth north conditions. Bob followed me and Don across Kahana Bay to play around with us in the spooky convergence lift that was going up everywhere over Kaaawa and Kualoa. 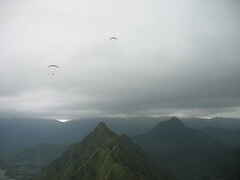 It was Bob's first time getting up over there and he made the most of it, zooming up to cloudbase over Kaaawa Valley (around 3 grand), specking out over Kualoa, heading farther out to sea than I've ever seen (at least a mile) without losing any altitude, returning to Kahana and then crossing the bay once more for good measure. After we landed, McCloud and One Eye showed up to check it out, but the conditions on launch turned out to be too strong and gusty for them this time around. Thanks to Don and Bob for joining me for one last memorable flight before I head off to DC for a month. See you all in January! From the Area Forecast, I wonder if "spooky lift" is what happens when a jetstream rips off our inversion: .DISCUSSION...A STRONG 100 KNOT SOUTHWESTERLY JETSTREAM OVER MAUI HAS BLANKETED THE BIG ISLAND WITH A THICK CIRRUS OVERCAST. THE JETSTREAMS TROUGH WEST OF THE STATE WILL BE DEEPENING THE NEXT 24 HOURS AND SHOULD SHIFT THE JET TO KAUAI AND SPREAD ITS EXTENSIVE OVERCAST TO ALL ISLANDS. TRADE WIND SHOWERS UNDERNEATH ARE ALSO BEING ENHANCED AS THEIR TEMPERATURE INVERSION CAPS ARE BEING WIPED OUT BY THE JETSTREAM OVERHEAD.